Welcome to another Etsy Day and our shop is called Red Crow Arts. This store is full of beautiful pottery, mosaics & beads....there's so much for your inspirational pleasure that you'll just have to visit & see for yourself! This week's lucky winner will receive this beautiful pendant & since it's the last saturday of August; there's also a prize from Unity!!! That's right, a very lucky winner will receive Time for Travel just for playing along with us! For your chance to win, visit the above shop, pick your inspiration, make whatever creation your heart desires & link your finished project to Ashley's blog. Have fun and good luck!!! If my card looks familiar, it's because I cased the layout from this post. I really love that pony card and the layout was great to me so why not case it?!! I took a shade of blue from the above posted pic and pretty much ran with it. My creation isn't exactly like the mosaic you see but IMO that's what inspiration means. I saw night of navy, bordering blue & shimmer white with a hint of gray. I like the final result even though I messed up on my paper piercing & I'm sure that whoever gets this card will not complain---at least that's what I'm hoping LOL!! Be sure to check out the rest of the DT & leave them some love. I'm sure their creations are beautiful!! Beautiful work, Jackie! Great use of the colors! Blessings to you! fabulous job, great snow cards! What a fabulous Christmas card. Love the colors and layout. Thanks for the inspiration. Your card definitely gets my in the mood for some cold weather!!!! It's beautiful! You consistantly post wonderful cards. Super cute! I love that inspiration piece too!! Your card in shades of blue is beautiful! Now you have a Christmas card done! Very pretty card Jackie! I love the colors and how elegant it is! Great card Jackie! I love the blues together. Oh, Jackie, this is SO pretty! Beautiful card Jackie! Have a wonderful weekend! Wow!!! I love your interpretation of the inspiration piece. So very beautiful and a perfect holiday card! I have an idea all picked out, hope I can play this weekend. Love it Jackie! So much great detail. awesome card, you did great. Jackie, these are so beatiful! Your attention to detail is fab! Very pretty Jackie! I love the sutle colors. Gives it a soft feel. The piercing was a nice touch too! Super job and I love the shades of blue you used. Very simple and clean...a style I like very much. Snowflakes are prettiest when on a card or picture! lol Your card is lovely Jackie! The inspiration piece is beautiful and your card is a wonderful take on the challenge!!! Love the beautiful colors and snowflakes...such a gorgeous Holiday card!!!!! 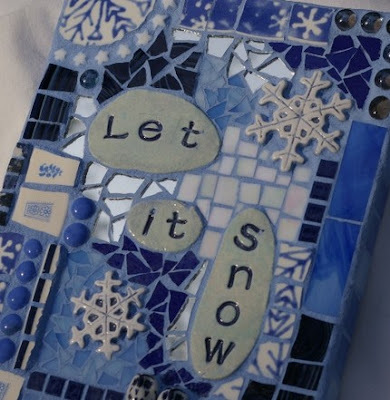 Ohhhh I sure loved this blue, snowy piece too! FABulously gorgeous card!!! Lovely card Jackie - I adore blue Christmas cards. So sophisticated. Jackie, great take on the inspiration piece. Love all the scallops (and especially how the ends of the Modern Label Punch work with the scallops!) Clean, simple layout. I'm SO not ready to think about snowflakes, though! 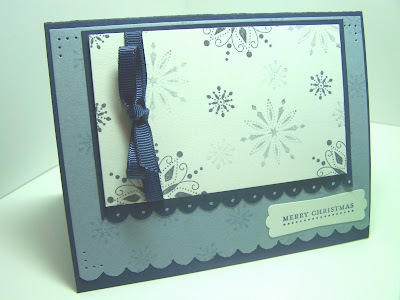 Absoluetly gorgeous, I love christmas cards done in blues! Just beautiful, I love your first snowflake card! Your cards are beautiful, the top one with the snowflakes is my favorite!